The Marauder is the first of its kind, a foldable DSLR run’n’gun rig. It’s small enough to fit in your back pocket but when unfolded, it’s an extremely stable DSLR camera support. The Marauder is similar to one of our most popular DSLR kits, the Striker. But, as opposed to our Striker (which is composed of multiple parts and rods that are highly adjustable and can be reconfigured in an infinite amount of positions) the Marauder unfolds instantly to fit you and is ready to shoot in seconds. It folds up just as fast and can then fit into any carry on, backpack, purse, camera bag or cargo pants pocket. The Marauder includes both a gunstock and an adjustable handgrip to create a small stable framework. The Marauder includes our Gorilla Plate V2 as the platform for your camera. You can attach your Zacuto Z-Finder Mounting Frame to this Gorilla Plate V2. 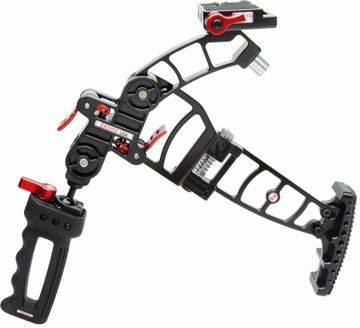 Attach your camera to the plate with the single ¼ 20 screw and quick release on and off the Marauder with the red quick release ratcheting lever. The Gorilla Plate can be attached at two different points. Keep the Marauder in a vertical position for use with a Zacuto Z-Finder. This will give you the correct distance from your eye to the Z-Finder eyecup. Extend the Marauder via the red push lever to place the camera further away for use without a Z-Finder. This gives you a bit more distance to focus on the camera LCD. The handgrip can be adjusted into five different positions for individual comfort and is locked with the release of the red lever. The grip itself also articulates and locks with red locking lever. Built into the Marauder is a gunstock with a comfy rubber pad. Adjust the angle and/or position of the gunstock with the two Allen screws to conform to your body size and shape. The Marauder folds up by first quick releasing your camera off the rig. Then push the red push lever to snap the camera support arm down. Push down on the silver circular cap to flip the gunstock away and depress the paddle lever to tuck the handle in place next to the gunstock. Reverse to quickly get the Marauder ready to shoot! Please click on our video tab to watch a short video demonstrating the collapsible features of this kit. Want to add front rods to hold a follow focus? Consider adding our Mini DSLR Baseplate. Need to adapt the Gorilla Plate V2 to a tripod/dolly/monopod etc.? Check out the Gorilla Tripod Dock. The Marauder can also be used with the Canon C100 with the Zacuto C100 Z-Finder Pro and grip relocator. We recommend using this larger Gorilla Baseplate. This baseplate can also be used with the Sony FS100 and FS700.